UPDATED: Beginning now and right up until the NFL Draft I will periodically write detailed scouting reports on players the Bills could be interested in. Since everyone knows the Bills have to acquire a quarterback either by the Draft, free agency or a trade…I’ll start with quarterbacks. Up first Oklahoma’s Baker Mayfield and Oklahoma State’s Mason Rudolph. Weak Points –Height, if he measures under six feet there will be teams that lower his grade. Has a chip on his shoulder and can show some immaturity at times with his reactions to some things. Seldom plays from under center. 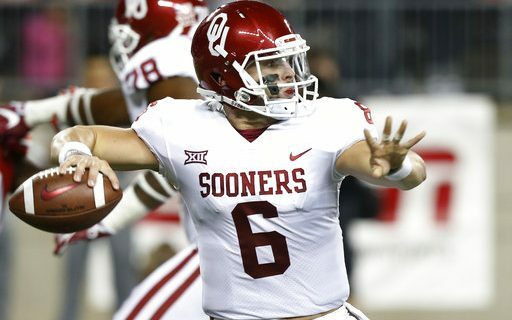 Summation –Baker is a fifth year senior who began his career at Texas Tech where he started as a walk-on his true freshman. After putting up huge numbers Texas Tech still didn’t give him a scholarship so he transferred to Oklahoma where he had to sit out 2014. Has been a starter the last three seasons and put up huge numbers. Threw for over 14,000 yards during his career and 131 TD’s going through this year’s Bowl season. Only thing he really lacks is ideal height. Will be the wildcard of this draft. If he was 6’2 he would easily be the first pick in the Draft. Now because of his lack of height he could still go in the first but may drop to the second. He can be compared to Drew Brees but he is a little taller and much heavier and stronger than Brees was coming out of Purdue. Has a little Brett Favre to him also. An interesting guy who should evolve into a winning NFL quarterback. Strong Points –Three year starter and very productive. Strong leader. Very smart and instinctive. Good arm strength. Very accurate with good ball placement. Shows he can go through a progression and make good decisions. Has good feet and good overall athleticism, shows he can move around in the pocket and keep plays alive. Has a strong feel for pass rushers and can step up in the pocket before he delivers. Good mechanics. Strong character guy who has excellent work habits. Wants to be the best. Weak Points –While he is a good athlete, he is not a real threat as a runner. Does not play in a very complex offense. Seldom plays from under center. His played leveled off near the end of the season and that is a bit concerning. Summation–Fourth year senior and a three year starter. Became a starter week 11 of his freshman year and has started every game since. Mason has been a very productive player and has thrown for over 13,000 yards and 90 touchdowns while throwing only 26 interceptions. Mason has all the tools needed to excel at the next level. Will need time to adjust to the NFL game. Physical skill set is good but the intangibles put him over the top. I see him as a starter by year two of his career. He might not go in the first round, but he will play like a quarterback who did. He’s one of the more underrated in this Draft. Click here for Greg’s scouting reports on fellow quarterbacks Josh Allen and Luke Falk.